The early leaders in the Premier Division are promoted FC Mexico who have made it two wins from two games so far this season since this elevation to the top flight, seeing off fellow promotes Barking & Dagenham Wanderers in the process. A 5-0 victory was achieved through goals from Chris Glensman, Dean Hendrickson, Ian Tucker, Rhys Tyrrell and Mujib Ayoola to secure the points. Romford Elite are a couple of points behind the leaders as they confirmed a first victory of the season in beating promoted Upshire. In a match of ten goals, Tyler Paterson, Ross Paterson and David Oyeleke all got on the scoresheet for the hosts but a Joshua Thompson hat-trick for Elite plus two goals from Ben Bickford and singles from Luke Thomas and Chris Bird completed a 7-3 win for them. Sitting in third place on goal difference are El Valiente who took on last year’s Division One champions East London Old Boys. East London took a two-goal lead in the match but saw that lead evaporate as Nathan Wilson scored twice and Aaron Marston once for El Valiente to complete the turnaround 3-2 victory and take home maximum points. The reigning league champions, Warren United, got their title defence underway with a hard fought win at on the road on Sunday away at Ultimate Vision. Joe Oates scored for Vision but Warren goals for each of Harry Agombar, Bradley Gates and James Peagram gave the champions a winning 3-2 start to the season. In the division’s remaining game of the second weekend, Flanders turned around their opening day defeat to secure maximum points from game two, ending the winning start for Brook Athletic in the process. Brandon Martin and Zaheen Khan got themselves on the Brook scoresheet but a brace from Shomari Barnwell and a Kweku Gyasi strike for Flanders won it 3-2 in their favour. In Division One, SL Menfica appear to be the side to beat in the division as they made it two wins on the spin at the start of their season with a comfortable looking 5-0 win away at Wanstead Albion. Goals from Connor Wheatley, Jack Barraclough, Thomas Rice, David Hornsby and George Boffa saw them top the table on goal difference. Just behind the leaders so far on goal difference only are Valiant who made it two wins from two with a hard fought 1-0 away win over Westferry Elite on Sunday. A single goal from Reece Bridgeman proved to be enough to separate the sides in what had been a very close encounter between two well matched sides. Promoted Chingford Athletic opened their league account for the season, bouncing back well from their 4-1 defeat last weekend with a 4-1 win of their own this weekend. They beat league debutants Virtue through a Michael Mignot hat-trick and a James Clarke effort to earn the victory. Goresbrook have resumed winning ways again this season and top the early standings in Division Two following a second league win on Sunday. They were up against the experience of London Fire Brigade but a Charlie Barrett double and a Johnny Gallagher strike were enough to earn them a 3-1 win and three points, cancelling out a Yomi Popoola goal for the hosts. There was a five-goal thriller at Mayesbrook Park where the returning Barking were made to fight hard for their victory against Sunday football debutants, Ferns Seniors. Sean Howe and Lee Niven both scored for Ferns but Barking goals from Michael O’Brien, Aaron King and Ben King completed a 3-2 win. If five goals weren’t exciting enough, there were six goals in Beckton where Royal Albert’s league debut came at home to the renamed and revitalised Walthamstow Avenue. Ray Richardson, Bradley O’Donovan and Zachery Leitch scored the Walthamstow goals but Albert also scored three times to take a share of the spoils in a 3-3 draw. There was an opening league win of the new season for Lonsdale who were up against the newly formed FC Kulture Klub in their own opening encounter of the season. Klodian Gjings proved to be the Lonsdale hero with a hat-trick, adding to an Anton Gjergji goal to render Shaw McKenzie’s goal for Kulture Klub as just a consolation on the day in a 4-1 result. The division’s remaining action saw a local derby in Dagenham as Bretons Manor opened up their league campaign with a the visit of Dagenham United to Castle Green in both sides’ first league matches of the season. The visitors scored one in each half through Isacka Mncube and Sean Thomas but a Jack McAllister effort for Bretons made it a nervy ending but were unable to force an equaliser as Dagenham United won 2-1. There were some fascinating matches in Division Three on Sunday as Alpha won again to go top of the table after the first two weeks of the season. They were taking on debutants Ping City Phoenixes who had their opponents in a degree of trouble at 2-2 as Bernard Eklund and Jack Flood found the target. But a late Alpha charge saw them win 6-2 to earn the points. Ashley Godwin and Kai Brown both scored twice with Louie Newell and Paul Jones accounting for the other goals. Sitting in second place are promoted Central Colts who took on some familiar faces at the weekend with the visit of E4 Rangers. A seven-goal thriller ensued between the sides with Tunde Olagunju opening his account for the season with Central Colts and accompanying strikes from Donovan Reynolds and Ansel Abrams onto the scoresheet in an entertaining 4-3 win. Macauley White got two in reply and Stuart Griffiths one but it wasn't quite enough. There was similar drama in Dagenham where Dagenham United Reserves led and were pegged back twice against Thames Ironworks Community. Paul Bergamini scored twice and Charlie Land once for the Daggers but Thames got back on terms at 3-3 with just minutes to go. However the cruellest of own goals in the very last minute of stoppage time gave Dagenham all three points in a 4-3 victory. As comebacks go, Masterman’s on Sunday against West Essex will be right up there. West Essex led 2-0 at the break and had seen their opposition reduced to ten men. But a second half comeback saw Joe Phillips and Misha Djemaili both net before a late penalty save denied West Essex a victory in a dramatic climax as the sides settled for a point apiece. In the remaining game in the division, there was a closely fought match between Roneo Colts and Hornchurch Oakmont with the former looking to open their points account for the new season. Bobby Cass was on target for Hornchurch with their goal but a Tommy Harber effort for Roneo Colts levelled up the match at 1-1 which is how it finished. In Division Four, Grey Area are continuing to demonstrate what persistence can do for a club as they head the table following their opening two matches. They were on the road at Alliance United this weekend and Connor Frost was in hot form once again, netting a hat-trick to go with goals from Liam Pickett and Jack Malone in a 5-0 win. Sitting just behind the league leaders on goal difference are newly formed Woodford AFC who made it two wins from their two games with a 5-2 away win over Custom House Community on Sunday at the Terence McMillan Stadium. Charlie Saywood’s goalscoring streak sees no end as he netted a hat-trick for himself. Jayesh Barber and Samuel Hatcher got the other goals to see Woodford to victory. East Ham Inter are the other side to have won both of their opening games as they sit third on goal difference following a win over Oak Royals at the weekend. Goals from each of Rayan Bessadi and Sofyan Khalfi proved the difference between the sides as Inter moved to a 2-0 win in a competitive fixture. 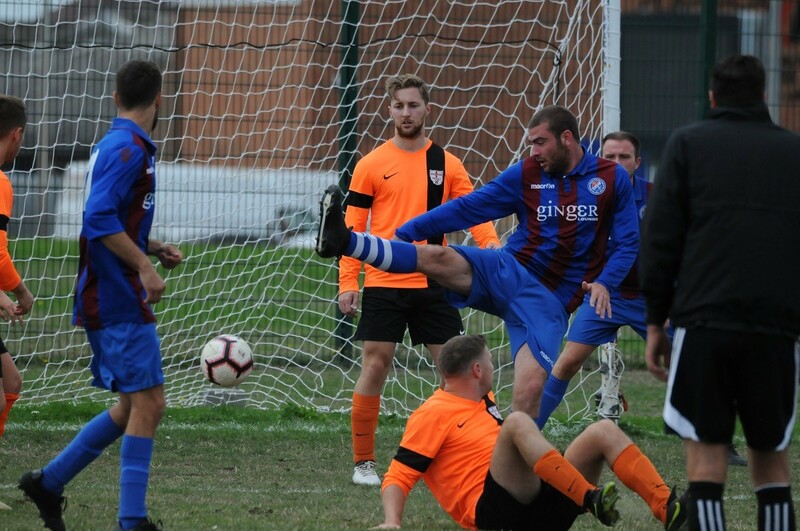 Epping Forest Falcons bounced back well from their opening day reverse last time out to record a first win of the season and open their points account, taking on the new Thames Ironworks Community Reserves outfit at Ashton Playing Fields. Peter Andrew scored twice for the Falcons and Alex Cachie once to overcome a Danny Child goal for Thames and seal a 3-1 win. Getting their points account underway on Sunday were Monkhams who bounced back from their opening weekend defeat to pick up a point against an in-form Newham Athletic side. Samuel Griffin had given Monkhams the lead but a late Wes Scott back-heeled effort for Newham rescued a point in a 1-1 draw. Completing the action from the second weekend the season was an East London derby as AC Milano Reserves return to the league saw a trip to Asianos Reserves first up. A well contested match saw the sides share a 1-1 draw and take home a point each to open their account for the season with Naeem Monsur on target for the hosts.